Twelve young business owners and founders are vying for the Philippines’ best student entrepreneur award on February 10, according to the Philippine chapter of Entrepreneurs' Organization (EO), a global business network, which is organizing the contest. The winner of the local contest will receive $1,000 in cash and a trip to Toronto, Canada as the Philippine representative to the Global Student Entrepreneur Awards (GSEA) Global Finals in April 2018 to compete with student entrepreneurs from over 50 countries. The GSEA Global Finals winner will be given a prize of $20,000. Founded in 1998 by Saint Louis University in the US, the GSEA claims to be the premier global competition for students who own and operate a business while attending college or university. This is the fourth year the GSEA competition is being sponsored in the country by EO Philippines. Jonathan Te, EO Philippines president, said the 12 semi-finalists were selected from a total of 32 applicants. The dozen contestants will be narrowed down further to four finalists, among whom the final winner will be selected. 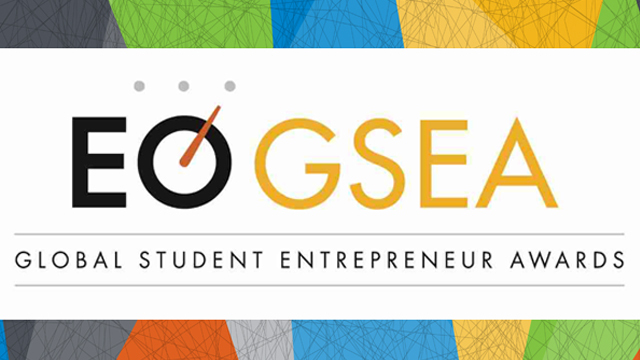 The GSEA is an annual program hosted and organized by the Entrepreneurs’ Organization that gives young business owners a chance to win capital and recognition that could help them grow their ventures. The program provides a platform where the students can connect with industry movers and shakers, allowing them to gain valuable insights and learn best practices, which they could apply to their businesses. The competition is open to all students of any recognized university or college for the current academic year and enrolled in school at the time of application. Participating students must be the owner, founder, or controlling shareholder of their respective company, which should be in business for at least the past six consecutive months, and must have generated $500 or received $1,000 in investments at the time of application. Adiel Sam De Jesus, a senior engineering student from De La Salle University, won the Philippine leg of the GSEA competition in 2017, besting 15 other student entrepreneurs. His company, Diversified Computer Learning Approach (DCLA), provides an output-based computer education module and software for elementary and high school students. In 2016, Nicolas Carunungan, a management student from the Ateneo de Manila University, was named the winner of GSEA Philippines. He took home seed money for BioScrub Inc., a company that manufactures butes hand scrubs to remove powerful stains from skin. The Entrepreneurs' Organization is a global hub for entrepreneurs with over 143 chapters across 46 countries. For over 20 years, its Philippine chapter is one of the leading sources of business trends for a variety of enterprises in the country. The organization is comprised of business professionals who are leaders in their respective fields. Why Did NFA’s Rice Stocks Plunge 72% in Dec? Is That Causing the Staple Food Price to Go Up?